I've appeared on Art Sippo's podcast many times. Dr. Sippo is a fellow of the Aerospace Medical Association, the American College of Preventative Medicine and the American College of Occupational and Environmental Medicine. He is also affiliated with the United States Army Flight Surgeons and The Fellowship of Catholic Scholars. In this podcast, Dr. Sippo, our mutual friend Tom Johnson, a veteran who wrote the novel THESE ALIEN SKINES about UFOs and had an experience with them in 1977 in the military, joined us. The main topic of our chat was the book UFOs & NUKES: EXTRAORDINARY ENCOUNTERS AT NUCLEAR WEAPONS SITES by Robert Hastings. 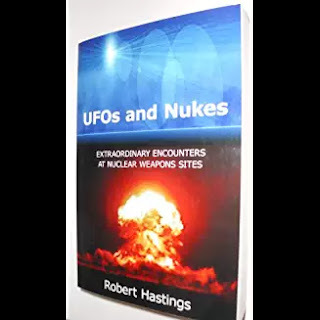 On September 27, 2010, CNN live-streamed his UFOs and Nukes press conference in Washington D.C. during which former U.S. Air Force officers described numerous nuclear missiles mysteriously malfunctioning moments after a disc-shaped craft was observed hovering near their underground launch silos. That shocking episode, in March 1967, was merely the tip of the proverbial iceberg. The book explores many more similar incidents. Of course as any conversation goes, we went off on many tangents about the UFO phenomena, including the Roswell incident in 1947, and various reported abductions. Here's the link to the podcast if you'd like to have a listen.